This year started off on a high note for Aqua Comms DAC when it launched America-Europe Connect (AEConnect), Ireland’s first dedicated subsea fiber optic network interconnecting Dublin, London and New York. After AEConnect went live, Aqua Comms built off of its momentum by forming strategic partnerships with multiple top-tier terrestrial networks, global data center hubs and interconnection facilities. Aqua Comms also made an agreement to use Equinix International Business Exchange (IBX) facilities in London and New York as carrier-neutral access points for its transatlantic submarine network. At this point, Aqua Comms was just getting warmed up. The company then completed a proof of concept of its encryption solution affirming AEConnect’s ability to handle government-mandated regulations for protecting in-flight data over transoceanic distances, as well as a test of 150Gbps per wavelength 8QAM (quadrature amplitude modulation) technology that will increase the Aqua Comms submarine network by 50 percent. 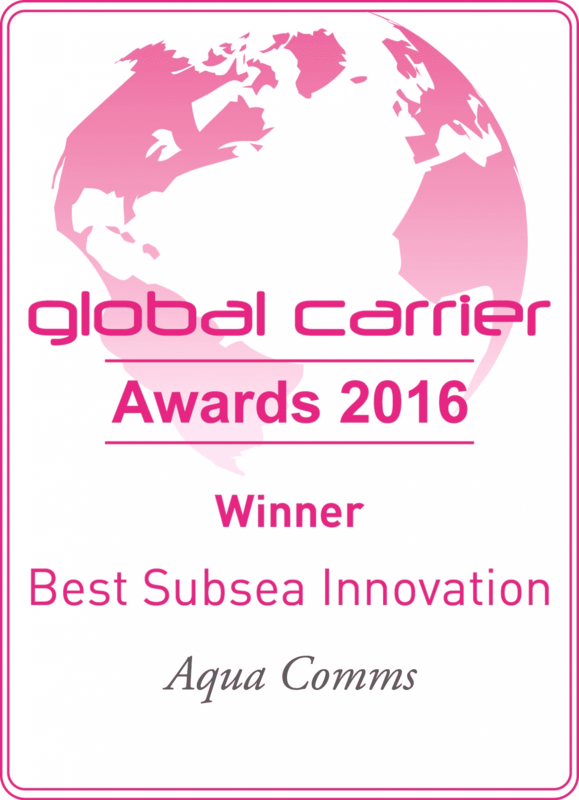 In light of these accomplishments, Aqua Comms has received the 2016 Global Carrier Award for ‘Best Subsea Innovation’ given by Capacity Media. Capacity Media’s Global Carrier Awards are awarded exclusively to the wholesale telecommunications sector. The awards ceremony, which included a special gala, took place on November 8 in Paris, and brought together the industry’s leading organizations to celebrate excellence and innovation. The Capacity Media honor follows in the wake of Aqua Comms’ co-investment agreement with the Ireland Strategic Investment Fund to support the company’s vision of offering secure, next-generation international data connectivity to the burgeoning Irish economy.